Put it all together and you have a BUGNOTTI! 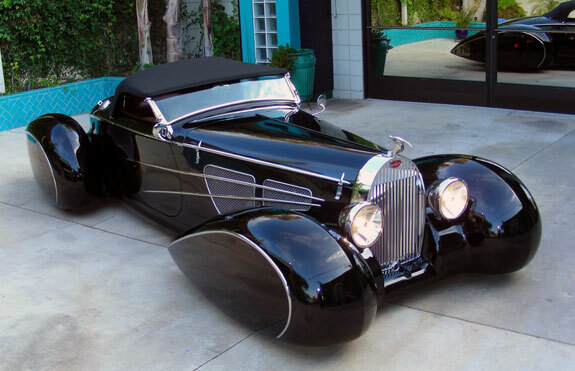 What do you do when you have a craving for a classic Bugatti or Delahaye but can neither afford one, nor would you want to cut one up to make it into your fantasy dream car? The answer Terry Cook came up with was to build such a car from scratch. 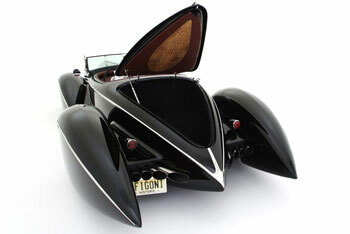 Starting with one of his composite Generation II Boattail Speedster bodies, which are manufactured by his company DECO RIDES of Long Valley, NJ, he radically modified the design incorporating styling ideas from a number of different cars. 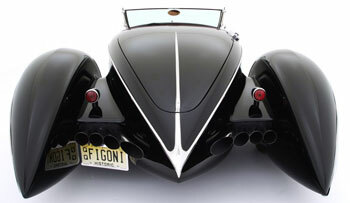 The body itself was designed eight years ago for Cook by top hot rod builder/designer Chip Foose of Huntington Beach, CA. 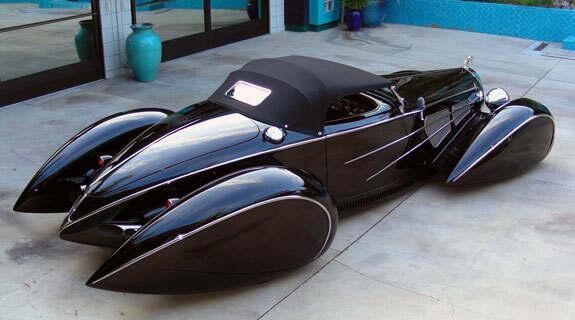 It is a cut down and streamlined version, inspired by the early Al Leamy and later Gordon Buehrig styled Auburn Boattail Speedsters. 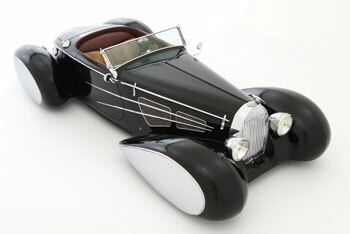 Relatively unknown clay modeler Vince Gardner contributed a lot to the styling of the second generation Auburn Boattail. 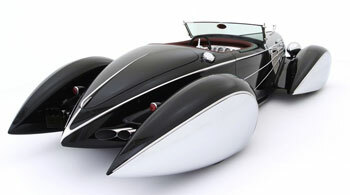 The fully enclosed "pontoon" fenders were strongly influenced by several mid 30's Delahayes designed and built in Paris by famed coachbuilders Figoni & Falaschi. The front tires steer lock to lock inside the somewhat bulbous front fenders that look like a Chipmunk with its cheeks stuffed with acorns. The grille shell is a faithful copy of a Bugatti Type 57 that has been chopped about 4 inches to fit the car. 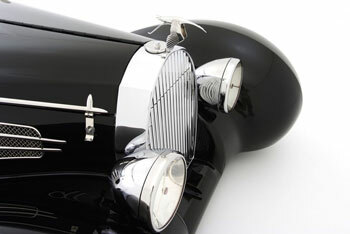 DECO RIDES also remanufactures dimensionally correct brass duplicates of the Bugatti shell with reproduction steel shutters in the grille. The radiator shell was capped off with a replica Hispano Suiza stork from American Arrow of Clawson, MI. Put it all together and you have BUGNOTTI, a car that does not pretend to be a Bugatti, but pays homage to this great marque as well as the incredible styling of Figoni, Leamy, Gardner and Buehrig. That explains the FIGONI personalized license plate. The sultry beauty of Grand Era French coachwork  the Bugattis, Delahayes, Delages, Voisins and Figonis of the world  has always had a strange effect on the hearts of men (and the women they seek to impress). RIGHT: Steven Tyler of AEROSMITH checks out the Bugnotti at Sturgis, SD Bike Rally with DECO RIDES' Midwest Sales whiz Juan "MOTYME" Rice of our Chicago office. 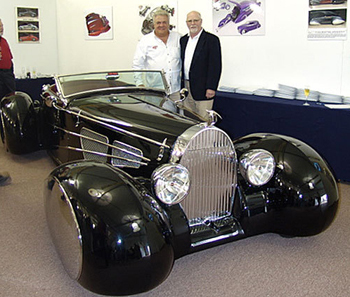 Using a Fat Man Fabrications boattail frame made for these bodies, Gary Brown of BROWN'S METAL MODS in Indianapolis started the project, mounting the body and hanging the fenders, making the car into a "roller." Because Cook pulled Brown off the BUGNOTTI Project to have him concentrate on building the DECO LINER Zephyr delivery, the project was moved to Delaware. 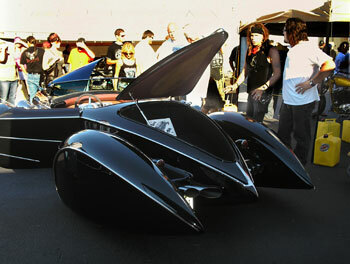 Ramsey Mosher of RAM's ROD SHOP in Dover, DE was given the impossible challenge of completing the car by a mid-July 2008 deadline for a major show. Ram had previously built Terry's SCRAPE steel '39 Zephyr, his 1956 Lincoln "TITANIC" and had worked on an assortment of Cook's other toys. Because of the wiring complexities of the BMW V-12 engine and automatic transmission and the deadline, the V-12 was snatched out of the car and replaced with a trusty LS-1 small block Chevy V-8 and 4L60E automatic transmission. The careful rubbing and loving of the body surfaces to make it mirror smooth was turned over to Brian Butler of Greenwood, DE. His EAST COAST RESTORATION & COLLISION team did the paint and bodywork using RM black and 5335 Glamour clear. The resulting superb finish shows that classic "black is back." If you wondered how the car manages to have trademark Bugatti-style louvers in the rocker panels of a composite body, Ram stamped them in a piece of steel and bonded it in place. 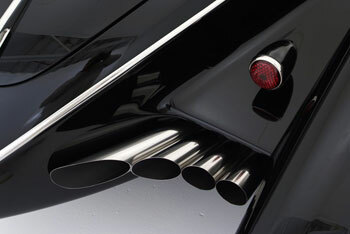 He also fabricates the sculptured eight stainless megaphone exhaust stacks that smack of a pipe organ. The subtly curved windshield was designed by famed sculptor Stanley Wanlass and is manufactured by RODWARE of Salt Lake City. 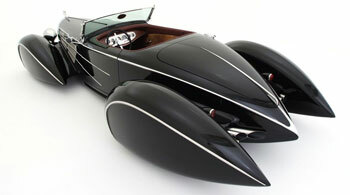 The car will tour the US during the summer of 2008 and will be exhibited in the DECO RIDES booth at Retro Auto in Pebble Beach the weekend of August 14-17. Like most of Cook's creations, it is FOR SALE to provide funds for numerous other current projects. Interested parties can email Terry at decorides@aol.com. Prior to the bodywork, the car was delivered to Stephen Pierce of ONE OFF TECHNOLOGIES of Gilford, NH. He fashioned the leather that has been "crocked" (converted to faux crocodile) together with a contrasting red leather to design and stitch the trim. 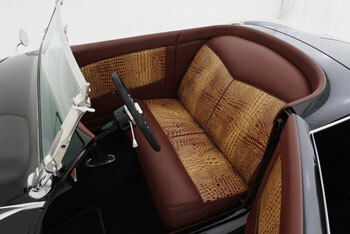 Because of time constraints, Strader's Auto Upholstery completed the carpeting and trunk interior. While in Gilford, Pierce also masterfully created the stainless steel brightwork trim that decorates the exterior. Copying a number of Type 57 and 57S Bugattis and Cook's design, he used polished stainless woven wire to fill the opening in the steel hood side panels. He then surrounded the openings with round stainless tubing he bent to shape and carefully removed the back half. The side spears were similarly made from oval stainless tubing that was carefully shaped. 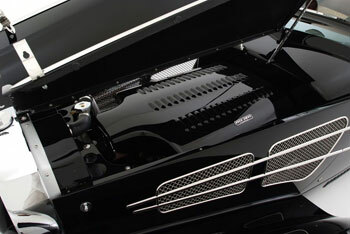 Studs were welded onto the back side of the trim to hold it to the body, and the stainless, including the sculptured megaphone "pipe organ" exhausts, was then painstakingly polished by Chris Wyckoff, Hewitt, NJ. One side of the car is decorated with the thin stainless trim, but the opposite side of the car has a large pair of pumpkin seed shaped fender skirts. They were hand formed by PANEL CRAFT of Bethlehem, NH and then the aluminum skirts were then chrome plated (!) by The FINISHING TOUCH of Chicago. Why the non-symmetrical approach? Cook loved both of the designs and figured you could only see one side of the car at a time. While BUGNOTTI has a lot of unique styling features combined into one car, the singular statement that Cook is trying to convey is the lavish use of polished stainless and chrome plated aluminum exterior body décor. It harkens back to the flamboyant use of brightwork by famed Paris coachbuilders Jacques Saouchik and Guiseppi Figoni, who are two of Cook's heros.